American Government has announced a bounty of 10 Million Dollars against Jamat Ud Dawa Chief Hafiz Muhammad Saeed and put him on America's most wanted list with Afghan Taliban leader Mullah Omar. 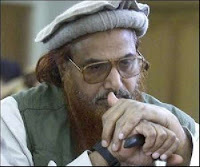 Hafiz Saeed is already India's most wanted man and India blames him for 26/11 attacks but Pakistani high court cleared him from Indian allegations and freed him several years back. JUD Chief Hafiz Saeed has reacted to American bounty of $10 million against him by saying that United States is frustrated by his campaign against reopening Nato supply. Hafiz Saeed is running campaign against reopening of Nato supply from several months. Nato Supply was closed last year by Pakistan when 24 Pakistani soldiers where martyred in a Nato attack on Pakistani check point near Afghan border. this step of American government seems to be a weird one because unlike other wanted people Hafiz Saeed is not hiding anywhere. he is living Pakistan like a normal citizen. secondly Pakistan's second highest Court Lahore High Court cleared him from all charges against him. Air Journey Not Safe In Pakistan?